The entry-level model features an 8-core processor with 32 gigabytes of RAM and a 1-terabyte solid-state hard drive. With a 27-inch Retina 5K display, the chassis boasts four Thunderbolt 3 USB-C ports, four full-size USB 3 ports, an SDXC card slot, and 10Gb Ethernet. The price will start at $4.999. Like other Apple Pro devices, iMac Pro will feature a space gray design and will be shipping with Magic Keyboard with numeric keypad and Magic Mouse 2 of the same color. Customers will be able to choose Magic Trackpad 2 instead of the mouse. 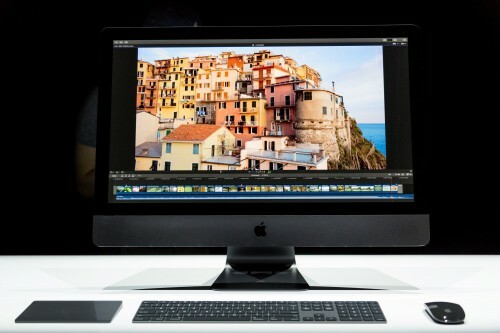 iMac Pro will have optional upgrades for GPU, CPU, RAM, and SSD, but the prices for them are not known yet. It’s for the first time that Apple gives a “pro” distinction to the machine that has been designed as consumer-focused.